The Brauneberg (brown mountain) vineyard is one of the most prestigious vineyards in the Mosel, in Germany, and even worldwide. 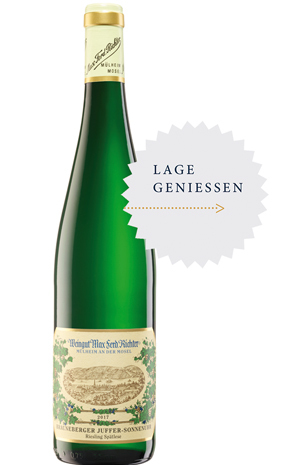 The single vineyard designation Juffer refers to the holdings of a former convent for young girls of noble descent, while the single vineyard Juffer-Sonnenuhr is in the heart of that vineyard (a ‘grand cru’ site), on the steepest parts of the mountain. In the Juffer vineyard the slate stone terroir features clay and ‘rosty’ or ferruginous minerals whereas in the Juffer-Sonnenuhr vineyard, Devonianslate turns to darker blue and rosty elements. The mountain appears brownish in color, thus the name Brauneberg. The grade of the slopeis as much as 80% in places. 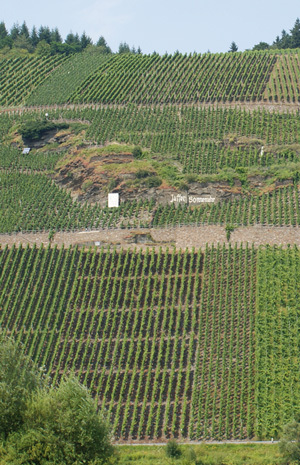 The vineyard faces south and has only a thin layer of soil over the rock such that in dry seasons growing vegetation can be extremely difficult. Nevertheless, Thomas Jefferson once described the wines from the Brauneberg as his favorite when he visited Mosel in the 1780s as an envoy of the United States to France. Richter has had a stake in the Brauneberg since 1643, when an ancestor purchased a parcel of vineyards there on the 17th of April of that year. The Riesling wines from the Brauneberg show delicate elegance and a clearly defined aromatic structure of citrus, white peaches and mature yellow fruit, and the iron minerals from the soil impart spiciness and lively minerality.